Black and white combos have been strong staples for fall for as long as we can remember, and whilst I love this combination I also have my eyes on the shades that come between them; greys. Will grey be replacing what used to be all-black or all-white outfits? I honestly think not, however grey makes sense and is easy to be styled. Being a neutral shade, consider grey your closet’s palette cleanser this season. And even though I am not ready to give up on my all-black ensembles just yet, I am more than open to start adding a dash of elegance, cool and class with this shade. There is something exceptionally refined about this colour, it’s timeless, effortless and adds a luxurious yet minimal hint to the whole look and I am all up for that. Easy but looks like I've made the effort, you know what I mean?! Grey works well with most colours (yes even brown). I chose to pair it with a pop of colour like dark red and plum lips too because nothing says casual chic for the weekend like grey, jeans and a bit of red. The outcome is a rich but understated look and you know how much I adore the whole cape/blanked wrap tendency, so I simply had to add a bit of that too. What do you think? Whichever way you choose to wear grey, as an all-grey look or just a grey item in your outfit, go for it! It’s not only trendy, but also very easy to style, classy and chic! And if you like the look of that satchel I am sporting, you are in luck! BonprixUK and I are giving away the exact same bag to one of my lovely UK readers (sorry rest of the world, your time will come!). It’s simple to enter, and easy to win! Follow Pam Scalfi and BonprixUK on Twitter and Use the Hashtag #bonprixadvent. There are ways to increase your chances, they are optional but highly encouraged; the more entries you complete the more likely you will win this gorgeous bag. This giveaway will run until TODAY Midnight ONLY so hurry! – This will run until tonight 12pm (GMT time). – This is open to UK residents only and BonprixUK will be shipping the prize once I have given them the winner’s details. – One winner will be chosen at random via Rafflecopter, and the lucky winner will win a Classic Grey Satchel Bag worth £29.99. – ALL entries will be checked and verified, with any lacking, dishonest or duplicate entries being removed completely. – BonprixUK has kindly provided the prize. – The winner will be notified on Twitter and will have 24 hours to respond. If the winner does not respond within 24 hours, an alternative winner will be selected via Rafflecopter's randomiser. Thank you for reading beauties and good luck! *Items sent by the brand and giveaway sponsored by BonprixUK. All opinions are my own (disclaimer here). Hun you look incredible. So well put together.I defo agree about the grey being a must have in wardrobes this season. I have my fair share of grey too. Giveaway is amazing...loved the outfitt. Bonito look, boa sorte às participantes. You look gorgeous in this blanket wrap! Burgundy color suits you so much. I love this outfit. Aw Pam, you so pretty! I have a similar cape and I haven't had it off this season. It's so snuggly. Lovely giveaway, I'm definitely going to enter it! You look so perf! Keep it up dear. I love this look Pam, you look fab! You look amazing as usual! Dark colours really suit you. great look! love the cape! Love the bag for my teen. This poncho is to die for! And it goes perfect with the bag, amazing! I love a touch of grey, particularly this shade. The cape is gorgeous too. This is the second post I've read today featuring grey eyeshadow, Anne did one too. I'm taking it as a sign that I need to did up my old grey eyeshadow to give it a whirl again. And lovely giveaway and good luck all contestants! gorgeous!! <3 amazing giveaway, love it!! Such a lovely giveaway! It's so pretty and you look stunning! that poncho looks so good with what you're wearing! This bag is gorgeous! Perfect for everyday and it would go with anything for any occasion! I love your style too - that blanket wrap looks super cosy! Wow, I love it! Have a nice day, sweetie! Party dresses by Nazz Collection on my last post HERE! Beautiful outfit! Love how you combined it, Pam. You look beautiful. Fabulous outfit, you look gorgeous! Great giveaway too. Can you believe I do not have tweeter, I am new in Instagram and I cant find time for more but I love the bag!! I sadly cannot enter, but it's such a lovely bag. What I'm in love with however, is the blanket from New Look, and your boots. You're looking fabulous and beautiful as per usual Pam, and you always have your style put together. It's lovely to see. I actually wore grey to work today. Great minds think alike! that poncho wrap is fantastic! you look fab! Loving the wrap and boots Pam! The bag has a lovely shape! Such a fun look! I love your booties, and that wrap is so perfect for the holiday season. Great post! Love your bag. Really love the color!! You look wonderful! Thanks for this amazing giveaway, just in time for Christmas! You look gorgeous, you have the loveliest hair I've ever seen! 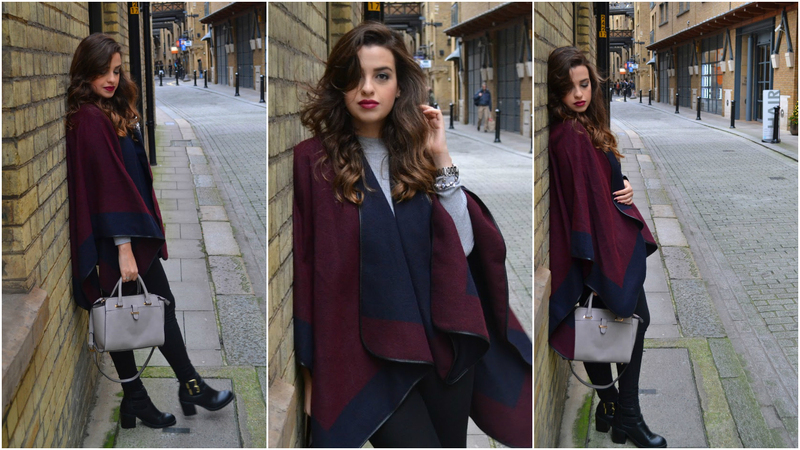 This outfit suits you so well & I love how you coordinated the burgundy colour on your cape with your lipstick and nail polish, such a nice shade for this time of year :-) I love everything about this outfit, especially those boots! Lovely post, especially the pictures! Love the way you paired it with boots, Pam! I love locations like this. You look stunning. Good luck to everyone. You look gorgeous! I like the touch of burgundy in fall! Perfect outfit, perfect bag and perfect shades!!!!! love your outfit & the colors! Great styling and beautiful pictures, I love the shades in your outfit!! That's a gorrrrgeous blanket cape. Love the color combination. As for the color grey, omg yes, it is probably my favorite color for the colder seasons. Plus, it has so many dufferent shades that almost everyone can find one they like! I agree that grey will never overtake a classic all black look but it's a great option to have ready to go in your wardrobe. Loving the burgundy and navy colors in this look! I've seen tons of grey around lately, and I have to agree - though I prefer black as well. Those boots are so cute, and I love the way you styled them! Ahh too bad I missed the giveaway! Love your outfit though! I like this very much similarly how I can make it possible for all days like this? How expensive does this whole outfit look, you look gorgeous Pam! It is definitely casual chic, and looks so comfortable and well paired together. Adoro a simplicidade do outfit e das fotos, menos é mais! I love your blog ! I'm here accidentally :) I am delighted! You look beautiful! I love the blanket wrap; gorgeous! Ohhh this outfit is gorgeous! Your poncho is so stunning and I love your bag. And your hair is very lovely as well. Great look hun! I love this look Pam! Thanks for commenting on Qing's Style. Please always keep in touch! Aha, but the light is at the end of the tunnel and I can finally see it now. Beautiful look! Love the colour combination and the wrap very much. 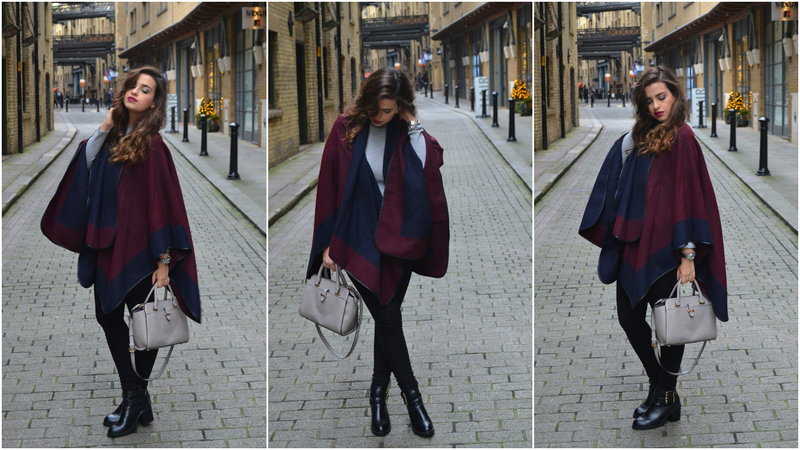 Your poncho looks great on your simple inner outfit. Totally gorgeous, love the color and the style of that poncho! I love grey, I feel all cozy when I dress in it. Plus, it is pretty easy to pair, so you get a lot of wear out of it. The combination of colors for this outfit is fabulous, Pam! Plus that lovely bag, wow! Sad that the giveaway is only open for UK based contestants, but still, good luck to the lucky winner! Loving this look! Soooo my style and color palette! This blanket wrap is perfection!!! perfect look! You're so beautiful! I love this outfit! You have such a great style!